t.Well known for his baritone voice, Welles was also a well regarded actor who won many wards. These other Welles films were nominated for their list: The Magnificent Ambersons (1942, director/producer/screenwriter); The Third Man (1949, actor); Touch of Evil (1958, actor/director/screenwriter); and A Man for All Seasons (1966, actor). 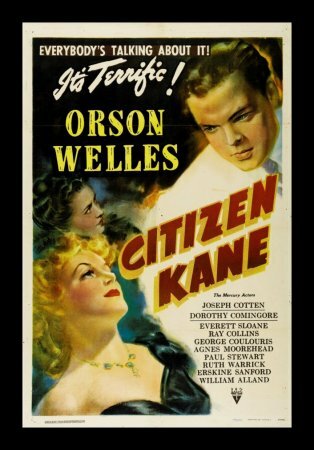 Citizen Kane was also nominated for numerous prizes at the 1941 Academy Awards, including Best Picture, Best Director and Best Actor in a Leading Role. The only Oscar won, however, was Best Original Screenplay, which Welles shared with Herman J. Mankiewicz.The Magnificent Ambersons was nominated for four 1942 Academy Awards, including Best Picture. The Stranger was nominated for the Golden Lion at the Venice Film Festival in 1947. Othello won the Palme d’Or at the 1952 Cannes Film Festival. In 1968 Welles was nominated for Best Foreign Actor in a Leading Role at the 21st British Academy Film Awards for his performance in Chimes at Midnight. Welles was given the first Career Golden Lion award in the Venice Film Festival in 1970, during the same year Welles was given an Academy Honorary Award for “superlative and distinguished service in the making of motion pictures.He was also awarded the French Légion d’honneur, the highest civilian decoration in France. He also recieved the American Film Institute Lifetime Achievement Award in 1975, and In 1978, Welles was presented with the Los Angeles Film Critics Association Career Achievement Award. In 1979, Welles was inducted into the National Radio Hall of Fame. In 1982, Welles was nominated for Best Supporting Actor in a Motion Picture at the Golden Globe Awards for his role in Butterfly, and won a Grammy Award for Best Spoken Word Recording for his role on Donovan’s Brain.Welles was awarded a Fellowship of the British Film Institute in 1983 and In 1984, Welles was given the Directors Guild of America Lifetime Achievement Award. Sadly On October 10, 1985, Welles died of a heart attack at his home in the Hollywood area of Los Angeles, California, and was found slumped over his typewriter, working on a new film script however in 1999, the American Film Institute ranked Welles as the 16th Greatest Male Star of All Time. When asked to describe Welles’s influence, Jean-Luc Godard remarked: “Everyone will always owe him everything.” Welles was also voted the greatest film director of all time in two separate British Film Institute polls among directors and critics, and a wide survey of critical consensus, best-of lists, and historical retrospectives calls him the most acclaimed director of all time. He was also voted number 16 in AFI’s 100 Years… 100 Stars list of the greatest American film actors of all time. best known for writing the novel The Phantom of the Opera, The French journalist and author of detective fiction, Gaston Leroux was born 6 May in 1868.His most famous work The Phantom of the Opera (Le Fantôme de l’Opéra, 1910), has been made into several film and stage productions of the same name, including a 1925 film starring Lon Chaney, Andrew Lloyd Webber’s 1986 musical and Joel Schumacher’s subsequent film adaptation of the musical starring Gerard Butler, Minnie Driver & Jennifer Ellison. The Musical still remains popular to this day and you can still see it in London, New York, Las Vegas and Budapest.Leroux was born in Paris in 1868 and went to school in Normandy and later studied law in Paris, graduating in 1889. He inherited millions of francs and lived wildly until he nearly reached bankruptcy. Subsequently in 1890, he began working as a court reporter and theater critic for L’Écho de Paris. However his most important journalism came when he began working as an international correspondent for the Paris newspaper Le Matin. On the following day Monday 6th May The Green Man enters Clun at about 11.00am there are morris dancers performing in the Square11:30am Entertainment starts on the BridgeWith Jack the Jester and The Samba band. From 12 midday the Procession starts and those who have made props in the workshops are encouraged to take part in the procession. Following their chosen winner the Green Man or Frosty. booooooooo! Morris Dancers, and Street Entertainers join in.12.15pm the highlight of the event is the Battle on the Bridge during which Frosty the Spirit of Cold tries to repel the Green Man as he tries to take over the Clun Valley. The Green Man must defeat the Frost Queen in The Battle on the Bridge or there will be no summer in the Clun Valley! At 12.45pm there Is a Craft Fair in the grounds of Clun Castle featuring many stalls, traditional craft demonstrations and entertainment from Dave Southern, the Bang On Samba Band, battle re-enactments with Swords of Chivalry, roaming entertainers, fire show, circus acts, magician, duck racing, live music, beer tent and refreshments. Best known for starring in t comedy television series MontyPythons Fying circus alongside Graham Chapman , John Cleese, Terry Jones and Eric Idle, the English Telvision presenter, broadcaster and comedian Michael Palin CBE FRGS was born 5th May 1943. The members of Monty Python were all highly educated. Terry Jones and Michael Palin are Oxford University graduates; Eric Idle, John Cleese, and Graham Chapman attended Cambridge University; and American-born member Terry Gilliam is an Occidental College graduate Before Joining Monty Python. Palin wrote comedic material with Terry Jones on other shows such as the Ken Dodd Show, The Frost Report and Do Not Adjust Your Set. Palin appeared in some of the most famous Python sketches, including “Argument Clinic”, “Dead Parrot”, “The Lumberjack Song”, “The Spanish Inquisition”, and “The Fish-Slapping Dance”. ,The first episode of British sketch comedy series Monty Python’s Flying Circus aired on BBC One on the 5th October 1969 and there were 45 Episodes spread over four seasons until December 1974 on BBC Television. The comedy was often pointedly intellectual, with numerous erudite references to philosophers and literary figures. The series followed and elaborated upon the style used by Spike Milligan in his groundbreaking series Q5. The team intended their humour to be impossible to categorise, and succeeded so completely that the adjective “Pythonesque” was invented to define it.The shows were composed of surreality, risqué or innuendo-laden humour, sight gags and observational sketches without punchlines. They also featured Terry Gilliam’s wonderful and imaginatively bizarre animations, often sequenced or merged with live action. Broadcast by the BBC. with 45 episodes airing over four series from 1969 to 1974, The show often targets the idiosyncrasies of British life, especially that of professionals, and is at times politically charged, and over the years many of the sketches have attained classic status including The Lumberjack Song, Ministry of Silly Walks, Upper class twit of the Year,Spam song, The Dead Parrot Sketch (Bleedin’ demised, Joined the choir invisible 😀 and Bicycle Repair Man. S . Chapman also played the lead roles in two of the Python’s Films – Monty Python and The Holy Grail, Life of BrianEric Idle also appeared in the the children’s series Do Not Adjust Your Set, alongside Terry Jones, Michael Palin and Terry Gilliam’s surreal animations which linked the show’s sketches together, and defined Monty Python’s visual language in other media (such as LP and book covers, and the title sequences of their films). Often described as one of the most influential figuresibut human history the German philosopher, economist, sociologist, historian, journalist, and revolutionary socialist Karl Marx was born 5th May 1818 .His ideas played a significant role in the development of social science and the socialist political movement. He published various books during his lifetime, with the most notable being The Communist Manifesto and Capital; some of his works were co-written with his friend and fellow German revolutionary socialist, Friedrich Engels. Born into a wealthy middle class family in Trier, formerly in Prussian Rhineland now called Rhineland-Palatinate, Marx studied at both the University of Bonn and the University of Berlin, where he became interested in, but critical of, the work of the German philosopher G.W.F Hegel , whose ideas were widely debated amongst European philosophical circles at the time. He became involved with a group of radical thinkers known as the Young Hegelians, who gathered around Ludwig Feuerbach and Bruno Bauer. Like Marx, the Young Hegelians were critical of Hegel’s metaphysical assumptions,w. In 1836, he became engaged to Jenny von Westphalen, marrying her in 1843. After his studies, he wrote for a radical newspaper in Cologne, and began to work out his theory of dialectical materialism. Moving to Paris in 1843, he began writing for other radical newspapers. He met Engels in Paris, and the two men worked together on a series of books. Exiled to Brussels, he became a leading figure of the Communist League, before moving back to Cologne, where he founded his own newspaper. In 1849 he was exiled again and moved to London together with his wife and children. In London, where the family was reduced to poverty, Marx continued writing and formulating his theories about the nature of society and how he believed it could be improved, and also campaigned for socialism—he became a significant figure in the International Workingmen’s Association. Marx’s theories about society, economics and politics—collectively known as Marxism—hold that all societies progress through the dialectic of class struggle: a conflict between an ownership class which controls production and a lower class which produces the labour for such goods. Heavily critical of the current socio-economic form of society, capitalism, he called it the “dictatorship of the bourgeoisie”, believing it to be run by the wealthy classes purely for their own benefit, and predicted that, like previous socioeconomic systems, it would inevitably produce internal tensions which would lead to its self-destruction and replacement by a new system, socialism. He argued that under socialism society would be governed by the working class in what he called the “dictatorship of the proletariat”, the “workers state” or “workers’ democracy”. He believed that socialism would, in its turn, eventually be replaced by a stateless, classless society called communism. Along with believing in the inevitability of socialism and communism, Marx actively fought for the former’s implementation, arguing that both social theorists and underprivileged people should carry out organised revolutionary action to topple capitalism and bring about socio-economic change. Revolutionary socialist governments espousing Marxist concepts took power in a variety of countries in the 20th century, leading to the formation of such socialist states as the Soviet Union in 1922 and the People’s Republic of China in 1949. Many labor unions and worker’s parties worldwide were also influenced by Marxist ideas. Various theoretical variants, such as Leninism, Stalinism, Trotskyism and Maoism, were developed. Marx is typically cited, with Émile Durkheim and Max Weber, as one of the three principal architects of modern social science. Marx sadly passed away 14th March in 1883 but is widely thought of as one of the most influential thinkers in history, and had a significant influence on both world politics and intellectual thought, and in a 1999 BBC poll was voted the top “thinker of the millennium”. Robert C. Tucker credits Marx with profoundly affecting ideas about history, society, economics, culture and politics, and the nature of social inquiry. Marx’s biographer Francis Wheen considers the “history of the twentieth century” to be “Marx’s legacy”, whilst philosopher Peter Singer believes that Marx’s impact can be compared with that of the founders of the two major world religions, Jesus Christ and Muhammad. Singer notes that “Marx’s ideas brought about modern sociology, transformed the study of history, and profoundly affected philosophy, literature and the arts.” Paul Ricœur calls Marx one of the masters of the “school of suspicion”, alongside Friedrich Nietzsche and Sigmund Freud. Philip Stokes says that Marx’s ideas led to him becoming “the darling of both European and American intellectuals up until the 1960s”. Marx has influenced disciplines such as archaeology, anthropology, media studies, political science, theater, history, sociological theory, cultural studies, education, economics, geography, literary criticism, aesthetics, critical psychology, and philosophy. The reasons for Marx’s widespread influence revolve around his ethical message; a “morally empowering language of critique” against the dominant capitalist society. No other body of work was so relevant to the modern times, and at the same time, so outspoken about the need for change. In the political realm, Marx’s ideas led to the establishment of governments using Marxist thought to replace capitalism with communism or socialism (or augment it with market socialism) across much of the world, whilst his intellectual thought has heavily influenced the academic study of the humanities and the arts.